SSR LLC – IBM: Watson – Steak or Just Sizzle? IBM: Watson – Steak or Just Sizzle? IBM’s Watson AI platform is the company’s best hope for relevancy in the coming cloud-AI era of enterprise computing. IBM is one of very few companies with the talent to address complicated deep learning problems – only GOOGL and MSFT have more experts. This is reflected by the academic citations its scientists have earned, their prominence in recent publications, and their leadership in gaining AI patents. IBM has also amassed unique datasets (e.g. weather patterns, health records, financial transactions, etc.) applicable to real business needs, and built its AI into pre-trained API modules that offer myriad functions (e.g. voice recognition, natural language, image recognition, predictive analytics, etc.) available to integrate into customer applications. IBM’s cloud platform is equipped with AI-tuned GPUs and operates from a broader set of locations than its rivals, important for many enterprises. Uniquely, amongst top AI companies, IBM focuses on vertical applications, helping to build bespoke solutions in health care, financial services, retail and other industries – a market that we believe could be worth many $10s of billions. Here, IBM is strategically advantaged with strong relationships and experience in these sectors, and its services arm can help identify opportunities for AI, reformat customer data (a key step), and develop the application itself. We caution investors not to judge these implementations too quickly, as they will continue to learn and improve their performance with time. Talent is critical for AI and IBM is a leader. Scientific talent is a key ingredient for complex AI projects. Unlike traditional programming, deep learning is holistic, requiring experienced hands to make the model adjustments needed to achieve optimized outcomes as quickly as possible. 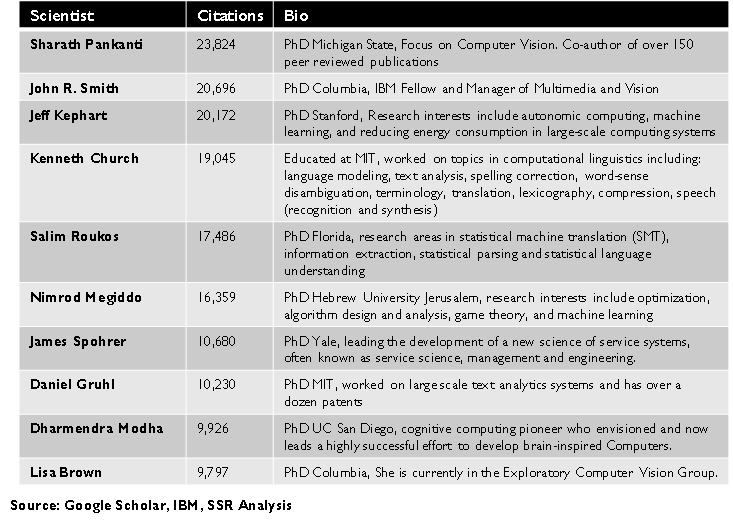 The supply of talent is very short, and demand for these scientists is high, but IBM’s roster of AI experts is behind only GOOGL and MSFT. IBM has 102 employees who have been cited at least 1,000 times in academic literature, more than double the count at either FB or AMZN. Indeed, IBM’s advantage over FB has grown over the past 6 months, counter to the narrative that it has difficulty holding on to its most valuable employees. IBM leads in AI patent applications, and is, again, behind only GOOGL and MSFT in papers accepted to the top AI scientific conferences. IBM has valuable datasets. 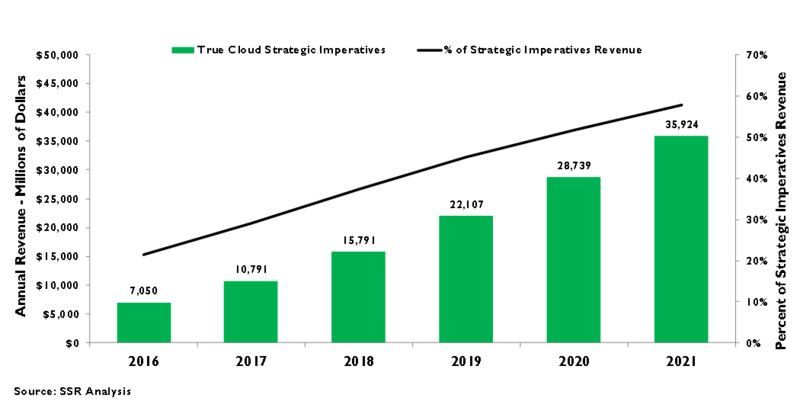 IBM has been an aggressive acquirer of data in recent years, building unique and valuable data assets across multiple business and scientific arenas. It has comprehensive weather data cut on a block by block basis. It has more than 400M health care records. It has well-scrubbed image, video and audio files. It has generic financial, sales and other business datasets behind its Watson analytics models, ready to customize to specific customer needs. Because its customer relationships are so broad and deep, IBM also has privileged access to their data as well. Watson has 17 pre-trained APIs. Given the scarcity of talent, few traditional businesses have even rudimentary AI capabilities. IBM offers customers on its cloud APIs accessing pre-trained AI modules offering functions like natural language interpretation, image recognition, predictive analytics, and news analysis. These functions can be easily added to traditional applications to enrich their functionality and their ease of use. IBM offers 17 APIs, quadruple the number available from any of its cloud rivals. IBM has a sound AI cloud infrastructure strategy. At the commodity level, we believe IBM’s public cloud platform will have difficulty competing with AMZN, MSFT, and GOOGL, as each can lever substantial consumer franchises to drive scale advantages. Still, IBM’s strength in helping enterprises migrate from private datacenters gives it advantages, particularly for AI applications. IBM’s cloud datacenters are smaller and more widely dispersed, giving it local presence in many more markets than its rivals – a key advantage with many customers. It is alone amongst the cloud leaders in offering extensive tools and services for customers balancing private datacenters, dedicated “cloud” assets and public cloud in a hybrid arrangement, a critical stepping stone for many traditional businesses. Finally, it supports AI with specialized hardware (NVDA GPUs) and broad support for popular AI rubrics. IBM alone with vertical focus. AI can make nearly any application better and can enable entirely new business opportunities (e.g. autonomous cars). Given this, the opportunity set greatly outweighs the scarce AI resources, and even the top companies in the field must focus their efforts. Amongst the leaders, only IBM is addressing vertical applications. MSFT, an enterprise powerhouse, has centered its attention on broad horizontal productivity tools, and while GOOGL, MSFT, and AMZN all offer AI hosting platforms, none of them provides development support or customizable analytics tools like Watson. IBM’s traditional competitors – e.g. HPE, ORCL, etc. – are neophytes with AI, leaving a flotilla of startups as Watson’s only real competitors. We believe industry-specific, often bespoke, AI applications can be a $100B+ market, with IBM positioned to take the lion’s share. Customer relationships are a big advantage. 5 years of declining sales has had a predictable impact on IBM’s salesforce – layoffs and defections leave it significantly diminished from its storied history. Still, the company still has the ear of executives at thousands of enterprises and institutional understanding of the business problems that their organizations face. This gives IBM a leg up, not just for Watson but for its cloud services in general. In helping IT managers deal with a heterogenous cloud environment, IBM can advantage its own value-added cloud services. Watson will be sticky and drive non-AI business. Unlike basic computing and storage services, which can increasingly be broken into containers and farmed to the least cost cloud provider, AI applications cannot be easily uprooted. Learning programs are holistic – not easily containerized – and IBM is selling hooks (e.g. APIs, datasets, customized development and support, etc.) which will provide both significant value add and customer lock-in. Moreover, we believe customer commitment to a Watson application makes it more likely that IBM can successfully compete for non-AI cloud hosting, hybrid cloud services, and SaaS software. We believe Watson can lead IBM to growth by year end. 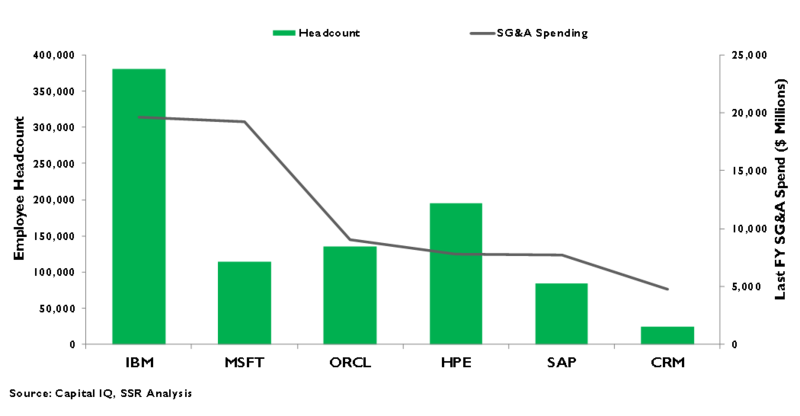 We recently assessed IBM’s likely revenue trajectory (http://www.ssrllc.com/publication/ibm-are-we-there-yet/), Dividing sales into four categories – legacy, non-cloud strategic, private/hybrid cloud, and true cloud – we believe that strong near 50% growth in the true cloud category, led by Watson, and teens growth in private/hybrid cloud will offset shrinking sales in the other two categories within 4-6 quarters. If so, we see this inflection point as a significant investing opportunity. Watson – The Game is Afoot! Investors are skeptical about Watson, IBM’s personification of its AI development platform. Presenting Watson as a “product” (and advertising spokesman) when it is, instead, a tool that helps make other products better, leaves analysts looking for a Watson sales line item. 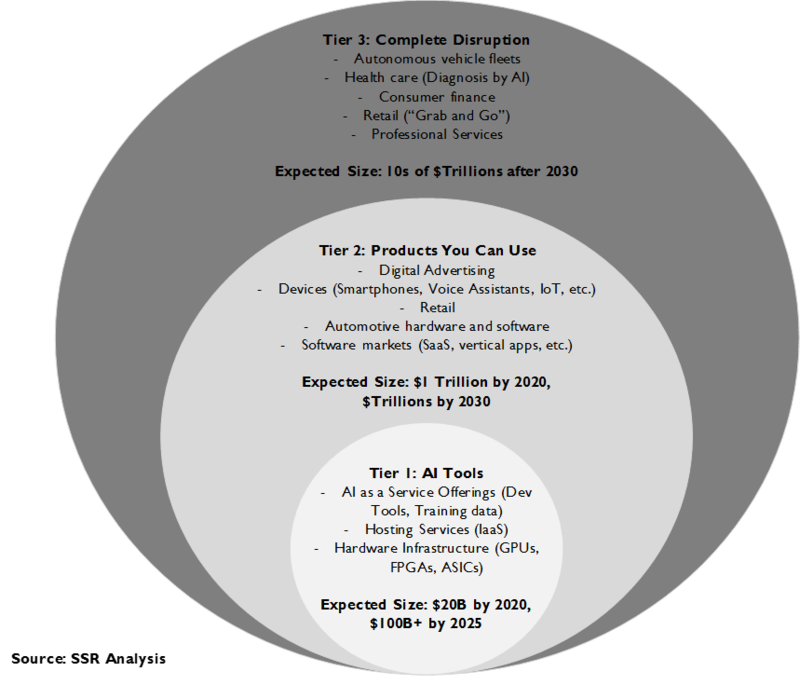 We believe this skepticism misses the big picture – AI will be a game changing technology affecting trillions of dollars of business, not just in technology, and IBM is one of a small number of companies well positioned to exploit the paradigm shift. High impact AI systems have three main ingredients – scientific talent, huge datasets, and AI-tuned datacenter capacity – and IBM has all of them (Exhibit 1) We have cataloged over 1,500 scientists working in AI, ranking them by the number of times their work have cited in academic literature. IBM has 102 employees with at least 1,000 citations, 22 of which have more than 5,000. This puts the company in 3rd place, behind Alphabet and Microsoft, but well ahead of 4th place Facebook and 5th place Amazon. IBM’s traditional IT competitors – e.g. 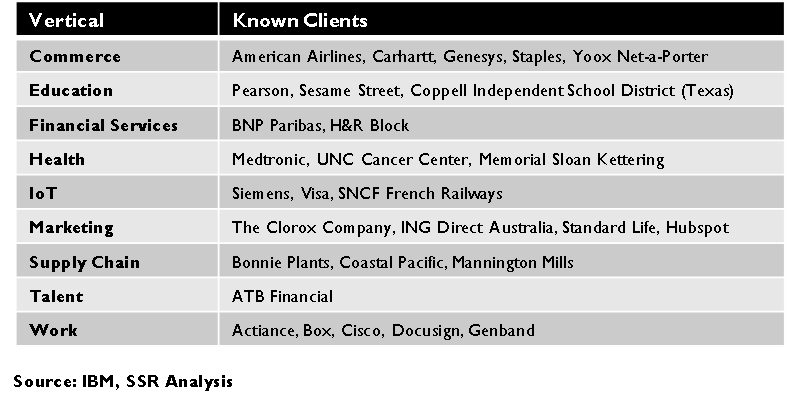 Hewlett Packard Enterprises, Oracle, and others – barely show up on the list. 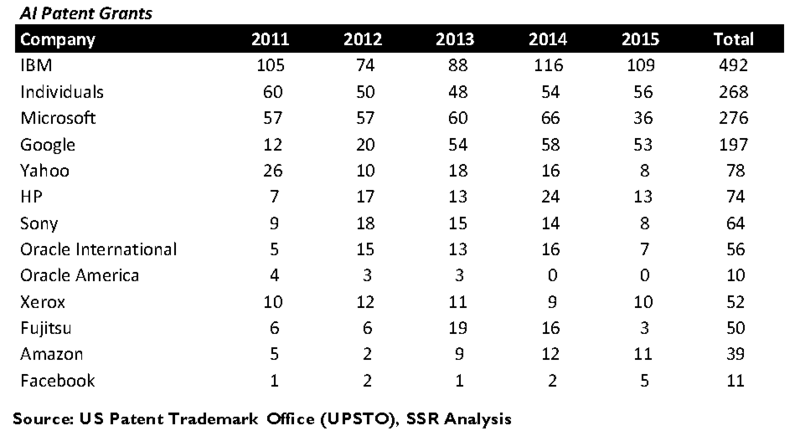 Importantly, IBM’s AI talent roles have been growing, belying the negative narrative, and its scientists have remained active – it has contributed the 3rd most papers to the top AI academic conferences over the last year. While IBM is a relatively profligate patent application filer, its leadership in AI patents, ahead of both Microsoft and Google, is impressive (Exhibits 2-6). IBM does not have the mountains of consumer internet data that are powering AI development at Alphabet, Facebook and Amazon, but it has aggressively built unique datasets valuable to its enterprise customers. It has acquired comprehensive weather data, and more than 400M health care records through M&A, and it has scrubbed sound, image and video datasets. It also has access to data through its customers, who rely upon IBM to extract its value. One way in which IBM monetizes its data is building pre-trained AI modules that its cloud customers can access via APIs. 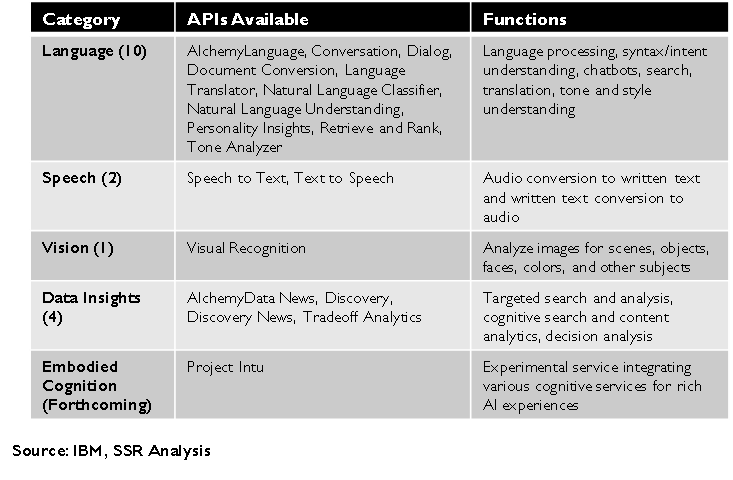 Watson includes 17 different APIs for functions including speech to text, image analysis, natural language processing, news analysis, and prediction engines. By comparison, cloud hosting rivals Google and Microsoft each offer 4 APIs, while Amazon has but 2 (Exhibit 7). IBM’s cloud is also a strength. Amazon, Microsoft and Google lever their ample consumer franchises to gain scale economy advantages, but IBM’s relative business focus offers benefits for enterprise customers. 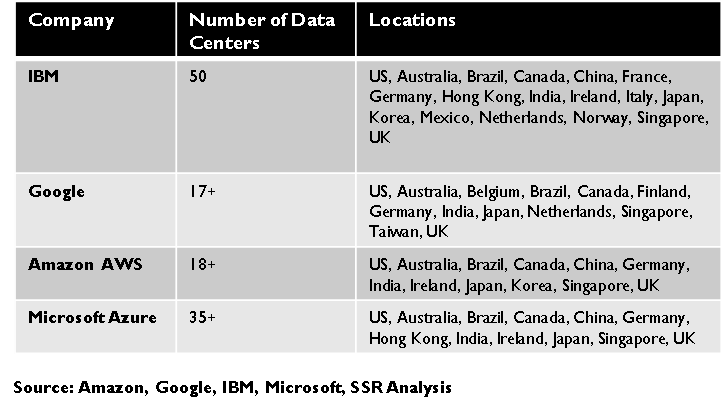 IBM operates significantly more datacenter locations, allowing them to offer localized services – important in many industries and countries (Exhibit 8). IBM is also alone amongst the major cloud operators that plays in the private/hybrid cloud market – many enterprises prefer to maintain control over much of their computing capacity, asking IBM to manage dedicated cloud servers and provide tools to bridge between their data centers and the cloud. This puts IBM in an ideal position to migrate these hybrid customers to its own cloud platforms, which includes Watson (Exhibit 9). It helps that IBM is largely addressing a different opportunity set than the other AI leaders. Alphabet, Facebook and Amazon are busy addressing myriad consumer applications for AI. Microsoft is focusing its strategy on broad horizontal management tools, levering Office 365 to attack the ERP market. In contrast, IBM is centered on industry specific vertical applications (Exhibit 10). 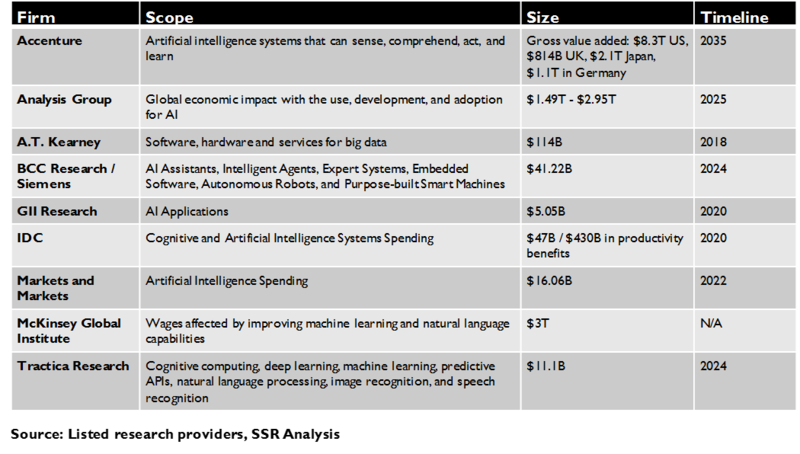 We think that bespoke AI-rich applications to address substantial business problems in industries like health care, financial services, energy, retail, and others have the potential to be $100B+ market within a decade (Exhibit 11-12). IBM’s focus on customizable analytics solutions, with services for data formatting, application development, and system maintenance, and a comprehensive AI and hybrid-cloud friendly platform, is a strong offering well attuned to the needs of these customers. In contrast, the other AI leaders offer relatively bare-bones, DIY AI platforms, while IBM’s traditional IT rivals offer nothing. In most of these vertical markets, the primary competitors will be startups hoping that even closer industry focus can make up for IBM’s obvious advantages. IBM’s massive sales force is a big advantage. Not only does IBM reach into dramatically more enterprise IT departments than Amazon and Google, but its connections often reach much higher into the organization than even Microsoft’s (Exhibit 13). It also touches many of these enterprises with its services business, putting its own employees shoulder to shoulder with the customer and working on strategically critical applications that could eventually lead to Watson. As we have noted, IBM leads the market for private/hybrid cloud solutions, a nearly $7B business for Big Blue and a significant potential stepping stone to IBM’s public cloud and, of course, to Watson. We expect Watson customers to be unusually loyal – computing tasks for AI applications cannot be broken into pieces and farmed out to the cheapest cloud option. The costs of moving an AI application from IBM to another platform could be high, particularly if the customer uses IBM’s data or its APIs. As such, available margins on Watson business are also likely to be healthy. Moreover, a commitment to Watson may make it convenient to move other applications to IBM as well. 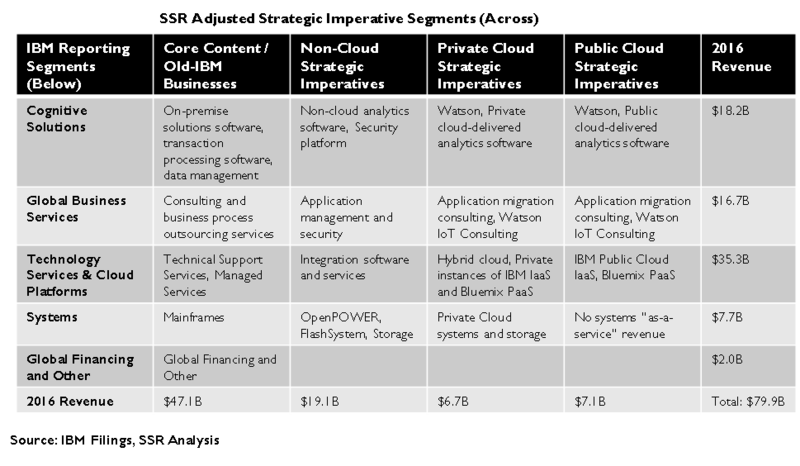 Recently we published our projections for IBM revenues (http://www.ssrllc.com/publication/ibm-are-we-there-yet/), breaking them into four categories: legacy, non-cloud strategic, private/hybrid cloud, and true cloud (Exhibits 14-16). Most Watson revenues are in the true cloud category, giving us confidence that that slice can sustain organic growth of better than 25% through the end of the decade. 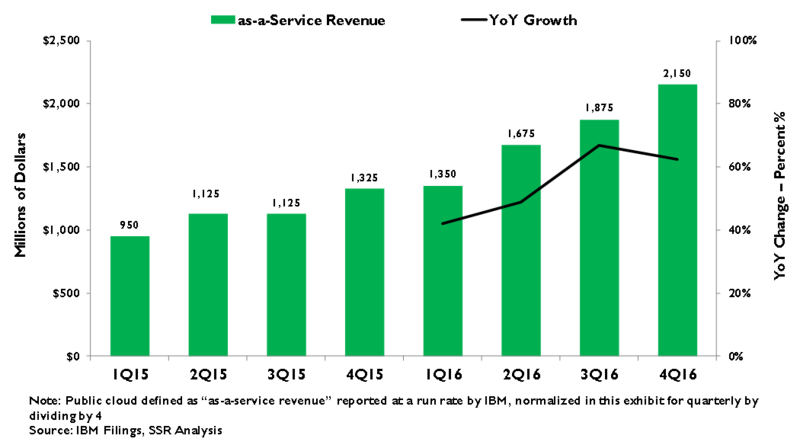 Combined with the private/hybrid cloud business, which we expect to decelerate from current mid-teens growth to 7% in 2020, we see IBM as hitting an inflection point for sales growth within 4-6 quarters. 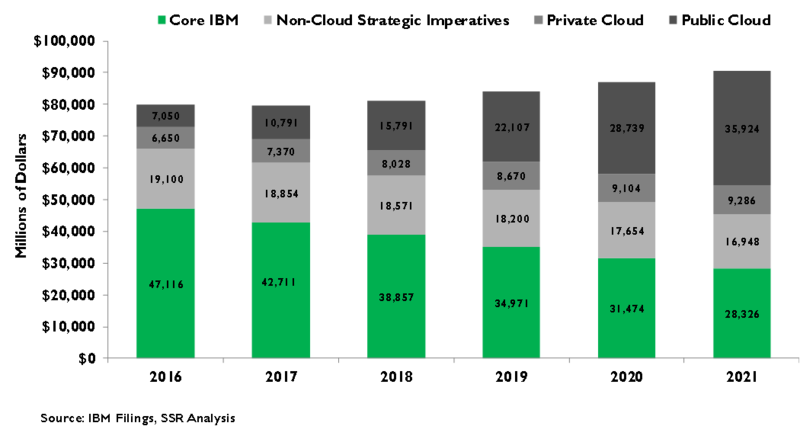 We believe a shift in the narrative to sustainable growth, even at a very modest pace, could drive a significant rerating of the stock.